Sonos Amp aims to be heart of your smart AV system | What Hi-Fi? Sonos has made three announcements at IFA in Berlin, including an update to its popular Connect:Amp. Sonos has some interesting news for custom install and AV enthusiasts, announcing a new set of control APIs for developers, a tie-up with Sonance to make in-wall and in-ceiling speakers, and a brand new Sonos Amp. The new Sonos Amp follows in the footsteps of the now quite long-in-the-tooth Connect:Amp, which allows you to add Sonos functionality to existing hi-fi and AV systems. The Amp features twin RCA analogue audio inputs and an HDMI ARC input, as introduced for the first time on a Sonos product with the new Beam TV speaker. It will be available to custom installers in the US from December 1st, costing $599, and will launch globally in February 2019. It will be 699 euro, so we'd guess at £699. The new Sonos device delivers 125 watts of power per channel, sports a new form factor and design - only available in black - and is designed to fit neatly into racks or be mounted for pro installers. It will also feature AirPlay 2, recently rolled out to other Sonos speakers, and can be WiFi or Ethernet-connected. You can choose stereo or dual mono sound, and there are custom speaker connectors. Joining the Sonos Amp will be in-wall and in-ceiling speakers, designed with architectural specialist Sonance. These will feature TruePlay room correction technology and will be able to be configured in a variety of surround sound set ups. Again, these are due for release in 2019. 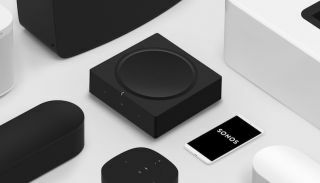 Lastly, Sonos also revealed plans for a new set of control APIs for partners, which aims to allow more developers to work with Sonos products and improve the Sonos experience, "especially those with integrated control systems, such as Control4 and Crestron". The new API controls include line-in switching, volume pass-through, the ability to add Sonos playlists within a third-party interface, and the ability to add notifications and alerts to other apps.